From what I can tell on social media, it’s really cold and there was a football game this week. Thanks a heap, Zuckerberg. You’ve really challenged our generation to be independent thinkers. Are you guys ready for some real brain-busters? Upper East Side: My first year here was wonderful, but I got reaaaally tired of being so far from the places I frequent. Lucky for me, I found an adorable studio in the UES and am all moved in — halleluyer! The Auction House: This hidden gem of a bar is conveniently just steps away from my new apartment. 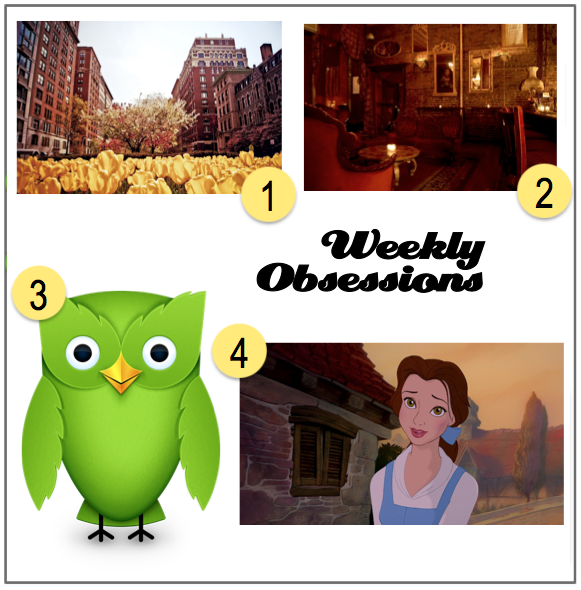 “Obsessed” is putting it mildly … the drinks are awesome, and the atmosphere is perfectly eclectic and cozy. Duolingo: I’ve been meaning to brush up on my Spanish for some time, and my friend recommended this easy-to-use app. You can play games, hear pronunciations and practice your own. Best of all, it’s FREE! ¡Que bueno! “Beauty & the Beast”: My amazingly talented cousin, Shannon, was just cast in her dream role of Belle and I couldn’t be more proud! She’ll absolutely kill it in her performances — congrats, cuz! Magz says : 01.08.2014 at 6:46 pm.p. La practica le hace perfecta!